For her This Is M.E. album cover art, Melissa Etheridge asked her fans to submit pictures. A mosaic from all these photos became the image of her on the album. As she said on her official website, "Because my fans are such a huge part of ME, and I wouldn't be ME without YOU, I took photos submitted by my fans and turned it into my album cover." This 2014 M.E. silkscreened tour poster features this unique artwork and includes a selection of U.S. and Canadian fall dates from the tour. 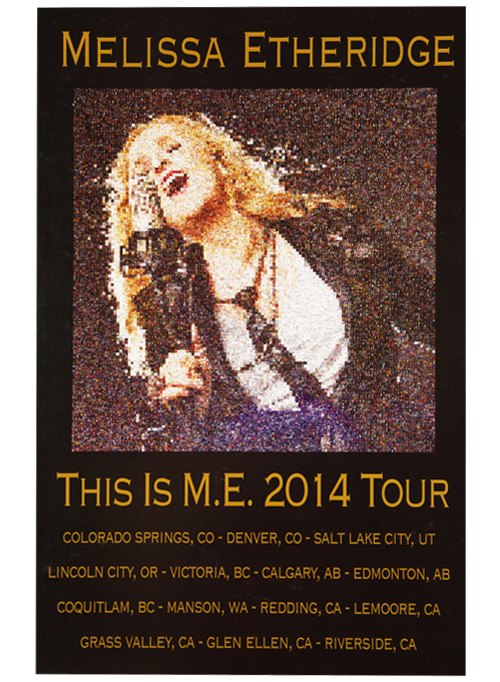 Celebrate the musical genius of Melissa Etheridge with this highly collectible tour poster. It measures 18 by 24 inches.